Instead of trying the key from the outside, as most critics of the right must, Colbert jiggled it from the inside, counterfeit though his key was. No one thought that Stephen Colbert, the character, would last this long. His right-wing, self-regarding, bloviating pundit was a shtick, a bit, good for a year or two, tops. But for nine years now Colbert has been reminding us that politics, and the right-wing shtick in particular, is a performance. * For his last show, tonight, the Grim Reaper will reportedly be taking him out. But we can thank his longevity in part to the still longer reigns of his sources of inspiration—“Papa Bear” Bill O’Reilly, of course, but also Sean Hannity, Rush Limbaugh, Steve Doocy, and the Fox News mindset itself. 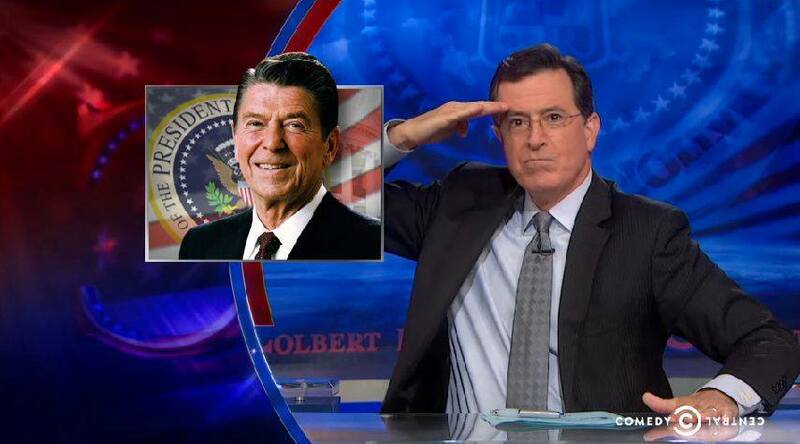 We can also thank these last nine years to the very thing that made them seem improbable: as a character, and not merely a critic, of the right, Colbert held a unique key to the riddle of modern conservatism: How do they keep getting away with it? Why have so many conservatives turned into such small-minded haters and deniers of science, of reality? Voters tend to disagree with their actual policies, so why do they keep voting for them? Instead of trying the key from the outside, as most critics of the right must, Colbert jiggled it from the inside, counterfeit though his key was. By inhabiting their heads via a character, Colbert could demonstrate, four nights a week, how right-wing psychology works. You can’t stick with that kind of truthiness-based character (and play him in public appearances off the show) without some sympathy for him, and even for conservatism itself. Colbert expressed that sympathy by showing that beneath his character’s assertion of omnipotence and certitude, there’s a fragility, one that’s also buried in most of the real-life blowhards and their dittoheads. If they stop clapping, Tinker Bell will die. If they stop nodding in agreement, or step off the reservation of Tax Cuts, Guns, and Built It Myself, they could get Other-ed. If you stop stampeding in one direction, you get trampled. Every night, Colbert’s character would steel himself to stay on the straight and narrow path out of fear. His braggadocio disguised the fact that he was a coward and a big baby. (In that, the character closest to Colbert would be Lawton Smalls, Marc Maron’s old right-wing foil who’d break down and sob when he could no longer maintain his political delusions.) Every now and then Colbert would come apart at the seams, hiding under the desk, or going off on how we have to wipe bears off the face of the earth! Conceivably, bears stood for Russia, as in the Reagan “Bear in the Woods” commercial, or maybe for Papa Bear. But more likely, Colbert’s bear fear was fear itself, an irrational dread of something he’d never encounter, like death panels or jack-booted government thugs coming to take his guns. Were they going to take “Sweetness,” the pistol he’d caress and which was, as far as we know, Stephen’s only serious love interest? More frequently, though, Colbert would ride fearlessly straight through his absurdities, oblivious to any problems at all. That was the Inspector Clouseau aspect of Colbert. It’s the character’s odd innocence and the real person’s heart that combine, I think, to create so much affection and outright love for Colbert. I’ve always said that I appreciate Jon Stewart (and I really, really like John Oliver), but I love Stephen. I laugh so hard I cry, and in crying, I swoon. It’s commonly thought that Stewart does the harder-hitting political satire. But Colbert, softly sheathed in fiction, can actually bite much deeper. Colbert is in fact more of a threat to O’Reilly—who seems to actively dislike him—while O’Reilly and Stewart are mutually supportive buds. Over the last five years you people were so good—over tax cuts, WMD intelligence, the effect of global warming. We Americans didn’t want to know, and you had the courtesy not to try to find out. Those were good times, as far as we knew. But, listen, let’s review the rules. Here’s how it works: the president makes decisions. He’s the Decider. The press secretary announces those decisions, and you people of the press type those decisions down. Make, announce, type. Just put them through a spell check and go home. Get to know your family again. Make love to your wife. Write that novel you’ve got kicking around in your head. You know, the one about the intrepid Washington reporter with the courage to stand up to the administration. You know—fiction! It’s hard to imagine that the nonfiction Stephen Colbert would say anything like that to a guest on The Late Show. But you never know. He’s amazed us before. *I was on the O’Reilly show years ago, arguing in defense of Martha Stewart, who was then headed to prison. After our joust, as I was getting up to leave, O’Reilly said to me, “The audience loves this stuff.” As if he was admitting it was all for show.